Iron Lion Productions was established in 2006 in New Orleans, by Mr. Sean M. Joseph (CEO) and Mr. Leighton Comrie. Its mission is to bring New Orleans Reggae culture to the forefront of the International Reggae scene by showcasing our unique and diverse singers and players of instruments, Selectors, Graphic Artists, Culture vendors, etc.. through our various local and International Concerts and Venues. We also promote healthy living and lifestyles through health conscious cuisine with a Caribbean theme. 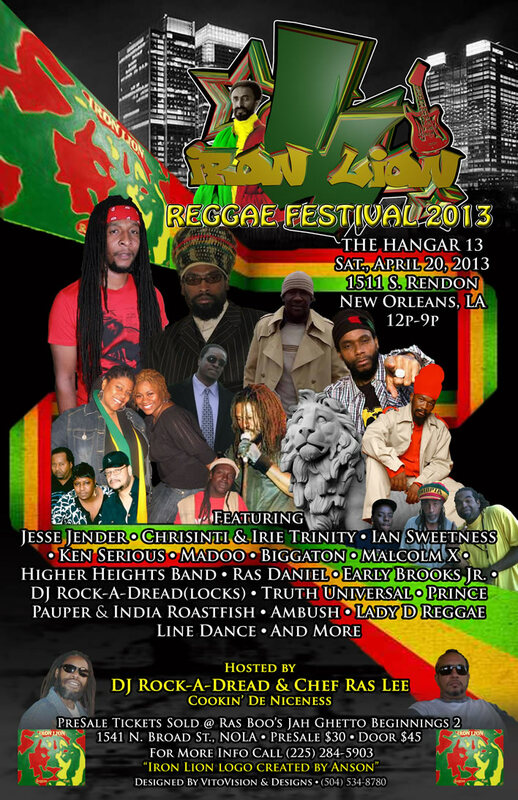 Iron Lion events cultivate communal unity by hosting events that bring cultural entities together throughout the year culminating with our Annual Iron Lion Reggae Festival. This year’s Fest is located at The Hangar 13, 1511 S. Rendon St. N.O.,LA 70125. This is our fourth installment and our second year bringing International and local acts together. We have experienced growth each year and this year is no different as it will be the biggest Reggae event hosted in the Crescent City in this decade. We are New Orleans only Reggae Festival and one of only two Reggae Fest. in the State of Louisiana respectfully. This year’s lineup includes International chart topper and singing sensation, currently with a number one hit “Heart of a Champion”..CHRISINTI; The RAS known as King Selassie I’s Furnace..CONGO JESSE JENDAH “The Teacher”; Jamaica’s finest veteran DJ, Chanter/Singer, Sprinter/Stayer..KEN SERIOUS; Jamaican singing sensation and veteran recording artist, MR. AUDIO himself, IAN SWEETNESS; Jamaican dancehall Champion, The Conscious One BIGGATON; The Original legendary dancehall singer from JA’s legendary StereoPhonic Crew, back in action for his first Official comeback performance ..MADDO MADOO; Plus world Champion Seleckta Malcolm X(formally of Stone Love Sound System); Alongside New Orleans legends, The Crown Prince, EARLY BROOKS,JR. & backing Chrisinti & Biggaton, the legendary HIGHER HEIGHTS BAND; plus The rootiest & finest Band in New Orleans.. AMBUSH REGGAE BAND; Iron Lion’s own rising star DANIEL CONGO; conscious Hip Hop Giant TRUTH UNIVERSAL ; Domino Sounds PRINCE PAUPER & INDIAN ROASTFISH; IRON LION’S SELECKTOR DJ ROCK-A-DREAD(LOCKS) and to top it all off.. SOSU & LADY D Reggae Line Dancing!!! In addition to the talent and equally important, We boast about our award winning Authentic Jamaican/Caribbean/Creole Cuisine prepared under the direction of Master JA Chef Ras Lee & Ras C.C.!!!! Tickets range from $20(US) early bird to $30(US)Pre-Sale to $45(US)door. For Vending or Sponsor info. Contact Sean M. Joseph @ smjoseph1@cox.net 0r cal 1-225-284-5903!! !